If you read my recent article - The Great, the Good and The Ugly 5.45x39 AR15 Builds you saw the very custom build prominently featuring the AP Custom AR Carbon Fiber Handguard. Without question the handguard put the custom build over the top… way over the top. Based on the background of the Russian surplus ammo powered 5.45x39 review, I set off piece by piece to create the ultimate 5.45x39 build which scream to be shot constantly. In the end I used a “Naked” un-anodized American Spirit Arms upper and lower receiver set, Ace Ultra Light stock, AXTS/Rainer Arms ambi-charging handle, Fail Zero carrier, Ace Ultralight stock with a custom tied paracord tube cover, AP Custom 15” Carbon Fiber forend, Houlding Precision Curse Muzzle Brake, a Barnes Precision parts kit, and topped it all off with an Eotech EXPS2 sight & G33.STS 3X Multiplier multiplier combo. Fully loaded the build weighs in at a feathery 7.2lbs with the optics. Ok yeah I may have gone overboard a bit on this build which totals around $2800 with the Eotech optics setup or around $1300 without the optics, however keep in mind I can convert this back over to .223 anytime. Meanwhile I will save around $240 per 1000 rounds - 5000 rounds and I come close to paying for this rig free and clean in ammo savings. 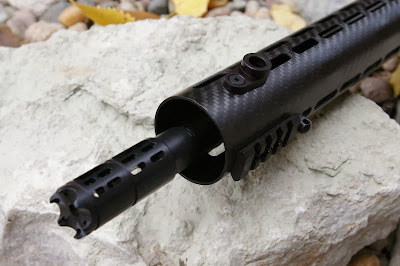 There are a number of carbon fiber handguards out there however AP Custom is unique from a couple perspectives. 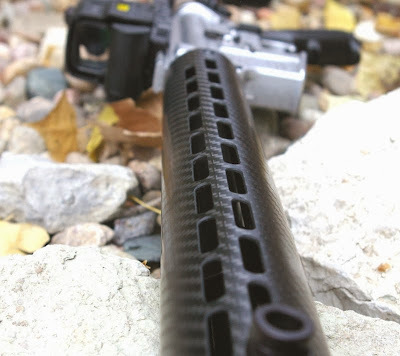 Most carbon fiber handguard nix rail options and sometimes even lose the top sight rail options, however AP offers two based handguard options; a “Tactical” model with a top sight/optic rail and another “Standard” lightweight version naked. Since I was following the “naked” theme, I opted for the lighter version without a top rail and picked up a couple short accessory rails for a bipod mount and tactical light mount. 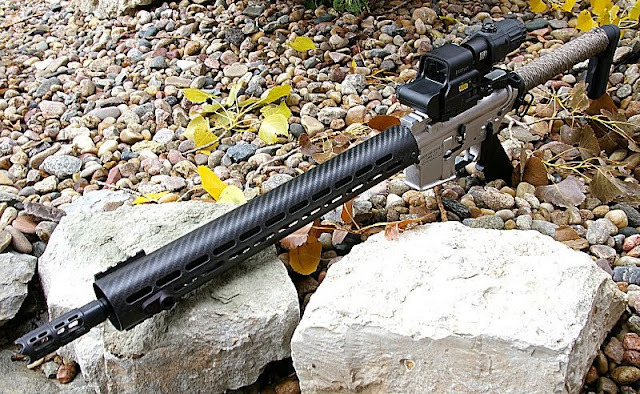 Along with various accessory rail options, they also offer QD-sling and bi-pod/sling studs for the handguard. The handguards are slotted at 2, 3, 6, 9, and 10 o’clock for additional clocking and to allow attachment points for the handguard accessories. 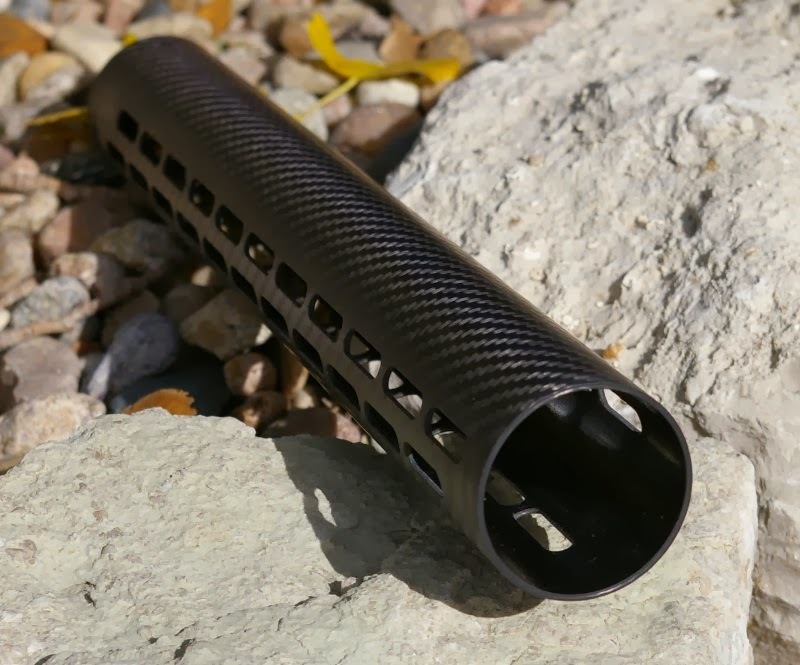 The AP Custom handguards attach to the gun using a proprietary trunnion system via a standard mil-spec barrel nut. You can use your standard barrel nut which can be attached with a standard Armorers wrench - no special tools required. The Clark Handguard requires epoxy, the AP Custom does not. If you are doing a new build just note that the Mil-spec barrel nut is not included. The finish is stunningly gorgeous, but a light wipe down tiny bit of oil on a rag makes the beauty of the carbon fiber pop. 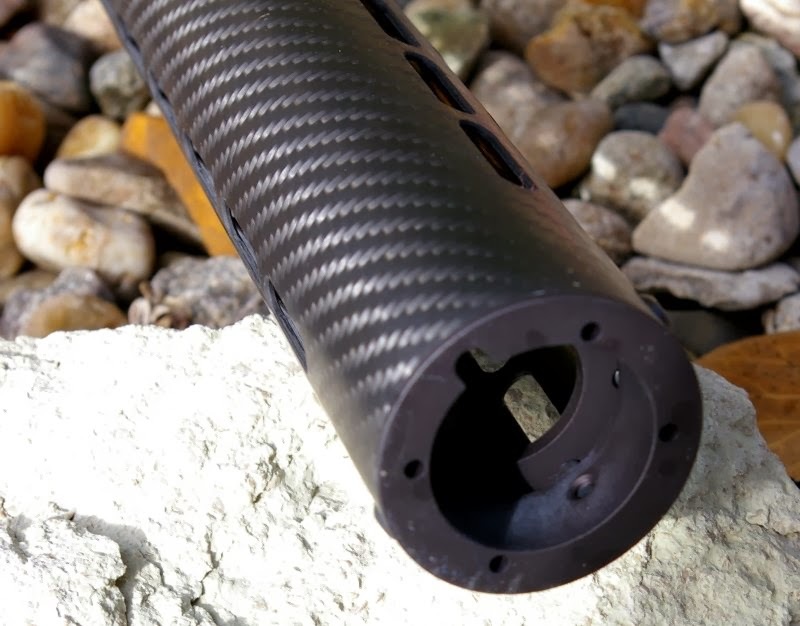 That cool factor of carbon fiber noted, carbon fiber offers way more to the shooter beyond just looks and delivers extreme light weight, very high strength, stiffness, and most importantly instant heat dissipation. For me this is the key feature of carbon fiber is the heat dissipation. Most people never shoot an AR15 to the point a glove is required to to hold the handguard. 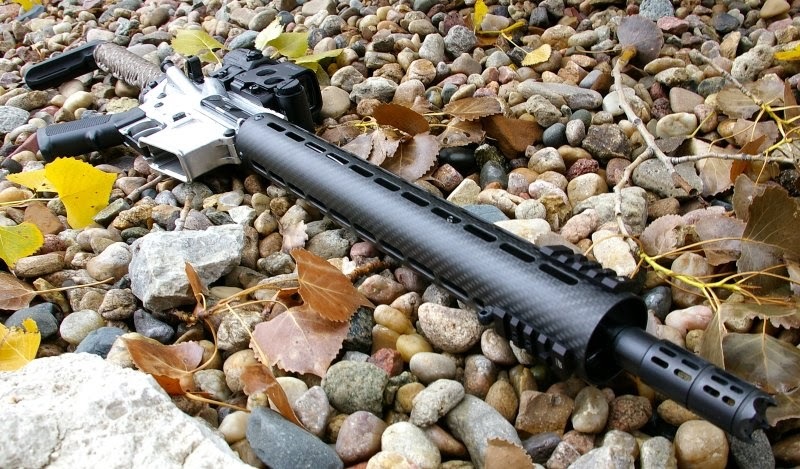 I will guaran-damn-tee that if you put five mags worth of any 5.56/.223 or 5.45x39 through a gun in pretty quick fashion your aluminum handguard will be so hot that it cannot be held with bare hands. Carbon fiber has the almost magical property to dissipate heat instantly so even if the gas block is glowing, a carbon fiber handguard will be exponentially cooler feeling than an aluminum forend. You tend to get carried away hammering super cheap 5.45x39 rounds downrange but even after the barrel and gas block is nice and hot, I can still keep shooting bare handed. 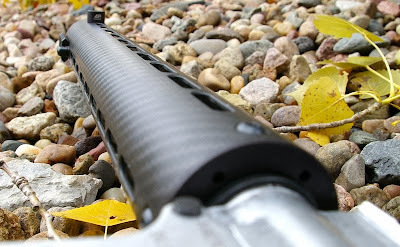 This is one reason I am now moving more and more to carbon fiber handguards… this is my forth. The 15” length is dramatic but is still only 6.2oz, but I love it because I have plenty of room to move my hands around, shoot of barricades at odd positions and still have room to mount bipods and tactical lights out of my way. If you want something shorter AP Custom offers Carbine length, Mid length, and Rifle length models as well in both the Tactical and Standard configurations. Readers know I try my hardest to accurately review and compare produces. 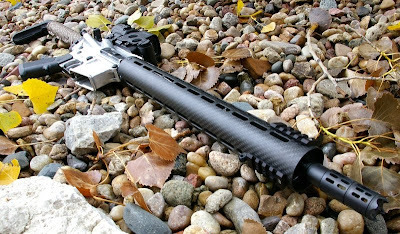 That said the 6oz Clark handguard I tested previously is lighter, and even the carbine length AP Custom is an ounce heavier simply because you need to add in the weight of the required Milspec steel barrel nut where the Clark’s is inclusive. All that noted I like the AP Custom a bit better because it offers the ability to add accessory rails and the slots line up well to access the adjustment screw on an adjustable gas block I added later on. Cutting into carbon Fiber is not a simple or easy exercise and technically should only be done in a fully ventilated and respirated environment. The AP Custom is the way to go if you need access to adjustable gas blocks, need a few extra holes, or want to add accessories. The AP Custom also does not require the use of epoxy like the Clark which allows the AR15 builder to remove, reuse, re-tweak, and re-install the AP Custom handguard as needed by just removing a couple screws. To me the ability for removal is a huge benefit when compared to the permanent one way install of the Clark. 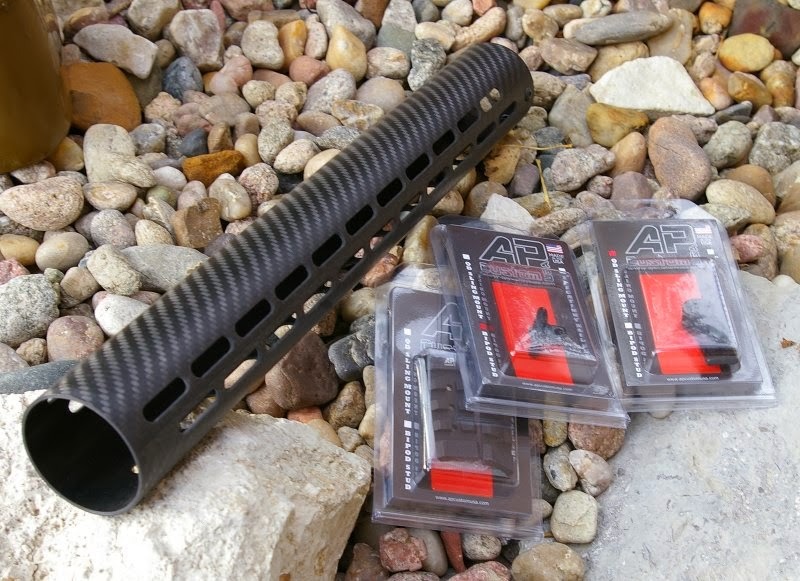 The AP Custom handguard offers users an awesome option for a practical high performance option for handguards. I believe we will see a lot of 3Gun competitors using these very quick. Looks great and performs even better. What kind and size length is the barrel? As I recall it is a .750" gas block 16" mil-spec profile Ballistic Advantage barrel.